A theoretical analysis was carried out on the change of composition of a deposit obtained by the dual pulse method of forming laminar metal foils, with transition from a low current to a high current pulse, both in the galvanostatic and the potentiostatic mode of deposition. It was shown that the existence of a transition layer of varying composition between a layer of pure metal 1 and a layer consisting predominantly of the metal 2 is an inherent consequence of the electrochemical process, primarily because of an induction period in the concentration polarization with respect to ions of metal 1. The importance of this transition layer increases as the thickness of the layers of the two metals decreases. Eventually this limits the possibility of obtaining a sharp boundary between the layers, when the nanometre region of layer thickness is reached. Equations are given for calculating the deposition current density and rate of stirring of the electrolyte which provide a deposit of a required level of metal 1 in the layer of metal 2, as well as a required sharpness of the boundary between two layers. Experimental proof of the correctness of the analysis was sought. It was found that significant changes in the properties of the deposit occur in the same range of layer thickness in which the transition of the composition takes places. 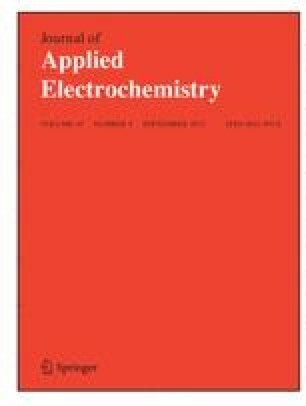 This paper is dedicated to Professor Brian E. Conway on the occasion of his 65th birthday, and in recognition of his outstanding contribution to electrochemistry.